Poor Accra Great Olympics are surely going to make a last gasp attempt to survive relegation, come Sunday,when they tackle their final GT Premier League assignment in their worst-ever season at the Accra Stadium. Perilously dangling at the bottom of Zone B after the penultimate stage, the Wonder Club of Ghana Football no doubt need to conjure magic in three days to catch the last breath.To say that Olympics require a miracle on Sunday is stating the obvious as their opponents, Real Sportive, are equally desperate to survive their maiden season in the elite division. With mere 14 points from a possible 39, nothing short of victory can save the once third force of Ghana soccer as the much-needed three points would be like a last straw to a drowning man. As the two top qualifiers are already decided in both zones, life at the bottom will generate all the interest, with Zone B especially promising a photo-finish. With only a point separating them, Sekondi Hasaacas and Power FC who are also deep within the relegation waters will be locked up in a fate-defining clash which neither side can afford to lose at the El-Wak Stadium in Accra. The situation at Kpando will be no different for visiting Feyenoord who have a high hurdle to clear in Confederation Cup candidates, Heart of Lions, to ensure a major leap from the danger zone. In Zone A, the battle for survival involves Okwawu United, B.A. 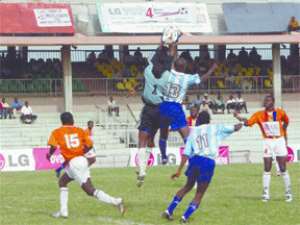 United and Bofoakwa, though Okwawu still hope to cash in on a protest against fellow strugglers, B.A, to avoid any trouble. But even in that case, Okwawu will still have to win their crucial home game against Arsenals which will be played on neutral grounds following their home ban.Interestingly, the dying “Soccer Apostles”, B.A. United, have a giant-killing feat to perform at home in their desperate bid to escape a straight demotion to Division One when they host zonal champions, Kumasi Asante Kotoko, at Sunyani. Knowing well they are still not too safe, one can trust Bofoakwa to put up a fierce fight against the season's most disappointing side, Ashantigold, at the Obuasi Len Clay Stadium. For the sake of their image and pride other than anything else, King Faisal who lost the other zonal Top 4 ticket and Confederation Cup slot to RTU will have a fine opportunity to visit their anger on them at the Kumasi Stadium tomorrow. At the same time in Accra, another disappointing side, Liberty Professionals, will make a desparate effort to halt their recent string of defeats to group champions, Hearts of Oak.